Rick Rubin is one of the music world’s most legendary and prolific music producers. Across genres, and for more than 20 years, he has consistently produced the most influential, and highest selling records in the world. Red Hot Chili Peppers, The Beastie Boys, Johnny Cash, System of a Down, Sheryl Crow, Lady Gaga, Jay-Z, Kanye West, Slipknot, The Dixie Chicks, Tom Petty and the Heartbreakers, Black Sabbath, Eminem, Neil Diamond, Adele – Rubin has worked with and helped to magnify the reach of all these artists, and this is only the tip of the spear. The reasons his music succeeds (and continually tops charts) where so many others fail is because he recognizes that great music is not about emulation or homogenization – it’s about connection. Connection internally for the artist – tapping into what is real, authentic and unique about them. And connection externally to fans – not all fans – but the select few with whom the music truly resonates. He believes it’s about going to the edges, rather than the middle, where real connection exists. This is how you gain true resonance. As this is true in art, it is also true in marketing. Great marketing should also divide your audience. No company, or message, can be meant for everyone. This is true for the most widely consumed brands – and even more so for the start-ups and mid-markets. The brute force of paid media is no longer the silver bullet – it’s authentic connection that creates real leverage. This holds true in B2B marketing as much – or even more so – than in the consumer world. Because as everyone tries to cram in every possible benefit: Reduce costs, improve efficiency, maximize performance. Or appeal to every possible aspiration. You will be focused on the one most important thing you do. As a result, you’ll be remembered while the rest fade into the background. More than your software, or technology, or process, or IP – what brings customers to your company, and ultimately keeps them there are your people. Because nearly all great technologies, or services – especially in the B2B context – are only as good as there implementation, execution and ongoing evolution. And all of those things happen principally because of your people. And here’s the other thing. In the B2B world – where so much of what’s sold is “me too” – it’s not your product that’s unique. But instead the people, and their unique personalities and insights, that are irreplaceable. The key takeaway: If you’re trying to build marketing infrastructure that will survive and thrive over the long-term, help your key people build and maintain a platform where they can aggregate attention, and build relationships. The truth is that few marketing campaigns have fans. Their success is transient and limited. People on the other hand do have fans. And beyond fans – they have relationships. This desire to connect is hardwired within us all – some scientists even declaring that the need to connect socially with others is as basic as our needs for food, water and shelter. And this desire to connect, especially with those we see as more expert, or capable of helping us advance ourselves and our station in life, is among the strongest draws of all (What burgeoning filmmaker wouldn’t follow Stephen Spielberg’s every word if he published a daily blog?). Yet as marketers, we often overlook our internal experts as marketing opportunities – instead turning to junior resources to be our voice and the internet to be our source of insights. The result is that we deliver the same tired information and boring product pitches – and are then perceived as a commodity. But in reality – it’s your key people, beyond all else, that truly make you a Market of One. Beyond that – it’s also what people want. 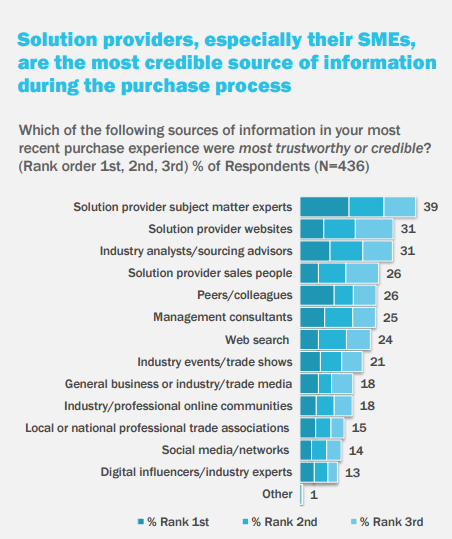 Consider this – this study by ITSMA found is that beyond analysts, beyond peers and colleagues, beyond any consultant or marketing collateral – what people find most trustworthy and credible in their purchasing experiences are the provider’s subject matter experts. Allowing their insights to shine through is what will separate you – and build the trust you need to win over the long term. To get started building your platform, here are the steps. It’s win-win. You build a sustainable, profitable marketing channel – one where you needn’t constantly recreate the wheel. Your experts love you because their value increases, they enjoy notoriety, and are then less likely to leave. And over time, you become a company without equal and without comparison. Truly a Market of One. Recently I watched this excellent video by Gary Vaynerchuk. In it he explains that he spends all his time in two places – the clouds and the dirt. The clouds meaning the vision. The high level. The strategy. The dirt meaning the execution – the how the vision comes to life. He wastes no time in between. For us as marketers, or anyone trying to form relationships and aggregate attention, this is where we need to be as well. The Clouds. What’s the big picture. The high level strategy. The next thing. What’s your take on this. The Dirt. What is the best way to make the vision real. The template. The plan. The hacks. The tweaks. The dirt – the medium in which the strategy can take root. This works at every level – whether you sell high dollar software or macaroni and cheese. Be your markets source for these two things – learn how to put your unique spin on them – and you’ll no longer need to chase. Your market will come to you.